The Zimbali Country Club is situated in the Zimbali Coastal Estate that is a breathtaking 700-hectare Coastal Resort on a pristine stretch of KwaZulu-Natal’s Dolphin Coast. It is a place of expansive beauty, endowed with lush vegetation and an abundance of indigenous wildlife. It is home to a magnificent 18 hole world championship golf course and it boasts a selection of restaurants including The Fig Tree pub and restaurant, Valley of the Pools- which is one of the most popular spots in Zimbali where visitors and residents alike soak up the sun and the Crowned Eagle restaurant which provides the most exquisite backdrop for a wedding reception. We have a Chapel Deck which is located in the expansive tropical forest where engaging service and attention to detail will ensure your special day is one to remember. Impeccable service, superb catering, a well – appointed golf shop and plush cloakrooms enhance the venue even further. The remains of a ruined farmhouse framed around an ageing wild fig tree dominates the entrance to the clubhouse. This feature marks the entrance of the modern, colonial-styled clubhouse and it bears testimony to the preservation ethos of the developers of Zimbali Country Club. The clubhouse has been designed and decorated in an African Classical theme, with extensive use of hand crafted décor, fittings and furnishings. Raised decks provide unparalleled elevated course and sea views, trees grow through decking leading down to the 18th green and parking for the course was carefully planned to minimize impact on the forest surrounds. 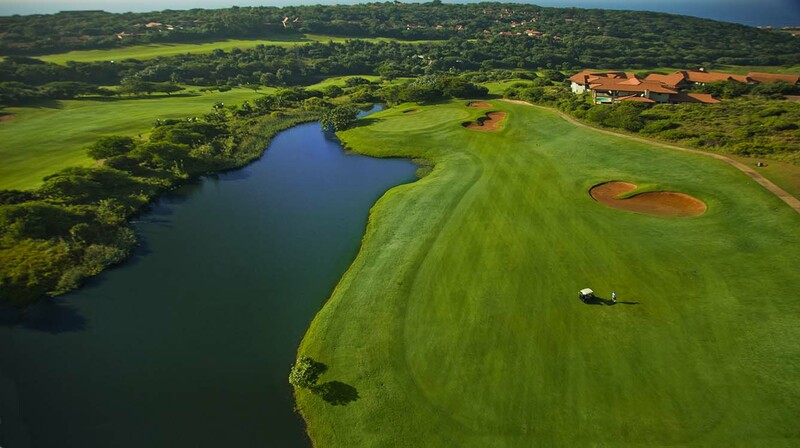 The Zimbali Country Club offers full amenities for golf, including golf carts (required), a halfway house, putting greens, a driving range, tennis courts and a bar and lounge facility which is of the highest order. Zimbali Country Club offers a unique, enchanting atmosphere where timeless memories are made.